Installing new showers, cubicles and and plumbing in existing bathrooms or in other rooms. How does The Shower-Man operate? Install a shower cubicle in bathrooms or other rooms e.g. a bedroom. The Shower-Man will plumb, tile (or fit tile panels or shower panels), install trays and cubicles, and install and certify any required electrical supplies. The process is that we will come and look at the existing plumbing and heating installation, discuss your ideas and requirements and draw up a written offer and specification for your agreement before starting work. 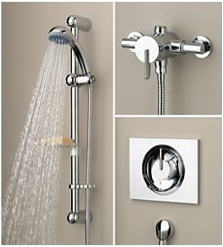 50plus is happy to install your purchased shower, cubicle and more. Do contact us to discuss your requirements or ideas. Obtain and fit spares. This may require two visits, the first to determine what is required. The sealant around the shower tray or bath. If it's cracked, mouldy or lifting then the chances are water is escaping. The shower tray. 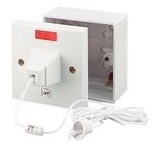 The older plastic moulded type are known to crack, look around the waste. Other common sources of leaks are from shower valves or pipe-work set in the wall and waste connections below trays and baths. Contact The Shower-Man if you have leak. We'll check out the situation and determine the best course of action. Typical times to repair and install showers. The Shower-Man at 50plus provides a professional and guaranteed installation and maintenance service for householders and businesses. 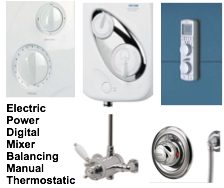 The service is an extension the the 50plus plumbing service and offers a range of works focussed on showers. 50plus has a client base of commercial and domestic customers and are experienced in small works, fault finding and refurbishment.